December has been a largely preparatory month for me. I’m planning to make a pretty serious change that’s required some groundwork. I’m honestly surprised by how uniformly supportive the few friends and family members I’ve run this plan past have been; I was all prepared to argue all the reasons why this is a good and well-thought-out idea, but no one obliged by disagreeing. Woe. More on that in the future, though. I’ve also been retreating a bit out of self-defense, by which I mean introversion. November and December have been pretty heavy on extended or back-to-back social things, after which my inner introvert curls into a ball in a dark corner and hisses at anything that gets too close. Part of this has to do with the holiday season. This is my first time living within walking distance of an urban downtown, and it was nice to be able to take breaks to just go outside and walk outside with all the lights up. And while people stress about the holidays, there’s also a lot of holiday cheer around, and I like seeing people going out of their way to be pleasant and helpful to each other. It’s too bad that sort of camaraderie is mostly reserved for special occasions. Most holidays I’m kind of ambivalent about. I like having time off, but there aren’t particular traditions I get caught up in. The trappings don’t mean anything special to me for most, but I am fond of Christmas. I missed one year while I was in Japan — I mean, I still celebrated, but it just wasn’t the same. Christmas is an Event in my family. Parts of the Event have fallen into disuse or evolved as we all get older, but certain things don’t change. For several days, the house goes on lockdown in preparation for Christmas Eve: the name of the game is Do Absolutely Anything That Will Keep My Mother’s Stress from Rising. My brother informs me that I have also grown tenser on Christmas Eve day with age, which I believe: I’m more responsible now for helping put it together, so it drives me batty when someone makes it harder than it needs to be. The Event is, essentially, a fancy dinner party for family friends, often in the range of 15 – 20 guests. I’m realizing that while I feel like I’ve spent a lot of time talking my mother out of making too many desserts, in the last few years she’s had to talk me down from appetizer craziness more than once. One year pretty much every appetizer and side dish was stuffed (we stuffed portabello mushrooms, tomatoes, peppers… I don’t even remember what else or what we put in them, just that we stuffed everything), and while it’s amusing in retrospect it was not one of our more well-thought-out menus. This year we started with cranberry and red wine-glazed meatballs, toasted prosciutto-wrapped figs, apricots with goat cheese and toasted walnuts, and smoked salmon in cucumber cups. We did more basic sides this year: Duchess potatoes and green beans in brown butter with pecans. And for dessert there was pumpkin bread pudding, apple/pear/cranberry crisp, and white chocolate bark. The first task that was ever designated as mine when I was little involved preparing the dining room. At that time my parents had this rug under the table with fringe all around it that my parents hated to untangle, and I was perfectly happy to crawl around singing myself Christmas carols and straightening it. 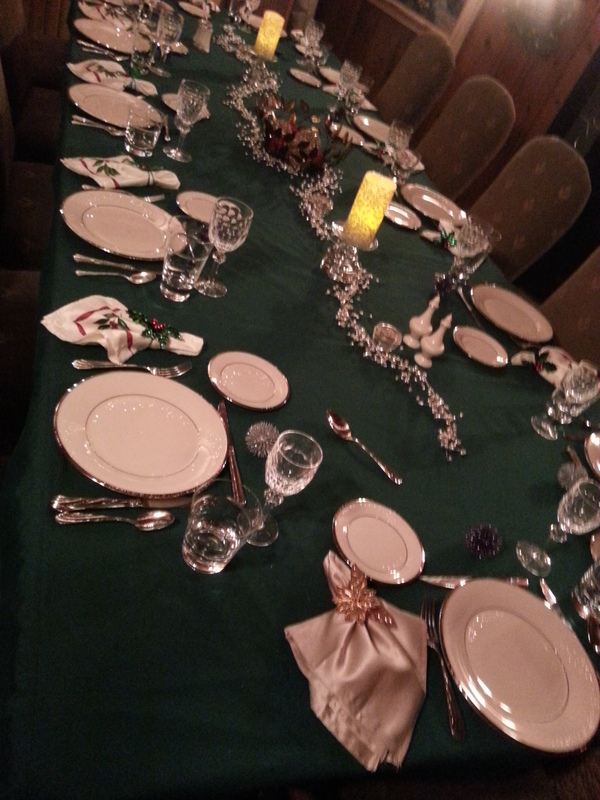 I think setting the table for Christmas Eve has become important for me because it’s like a gift. One I’m responsible for getting right, that will contribute to the happiness of the evening. Like a gift, what you choose and how you wrap it reflects the gift-giver, and it also affects the gift-receiver’s experience of, well, receiving the gift. 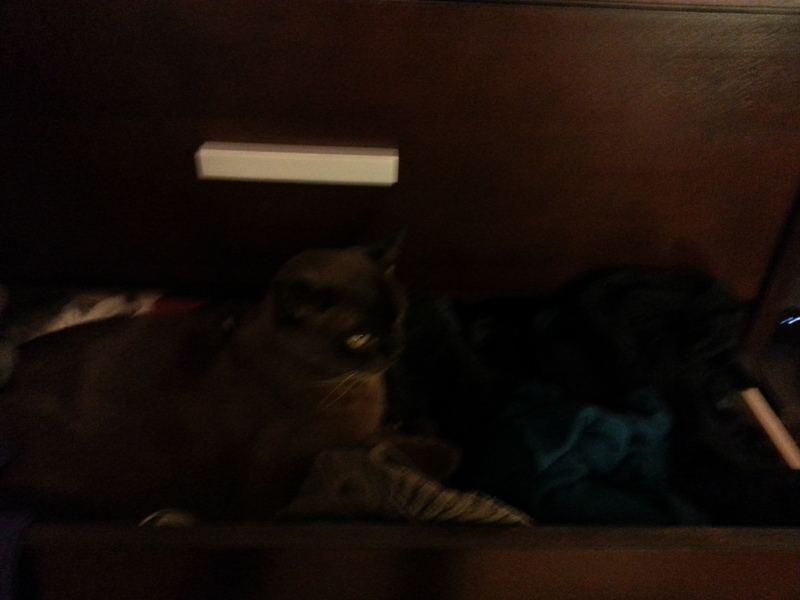 He put himself in the drawer. 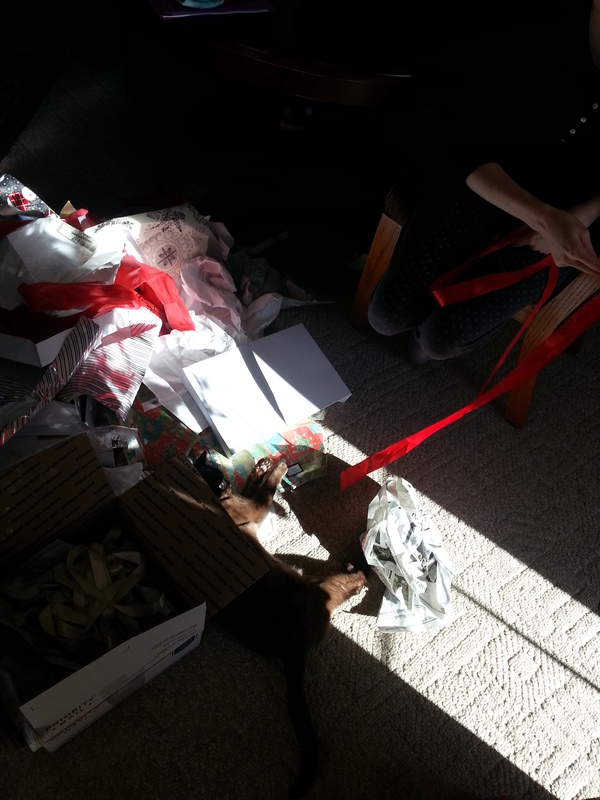 Completing Maysson’s Christmas with tissue paper, ribbon, and sunshine. Seriously, this guy is 15 years old and if anything has more energy and requires more attention than he did as a kitten. As for New Year’s, I don’t really do resolutions, because if it’s something that matters to me, I’m not going to wait for an arbitrary date to start. I will say that 2013 was not all I wanted it to be, so I’m taking steps. Here’s hoping that in 2014 I can get it together.